The Type 62 is a Chinese tier 7 premium light tank. 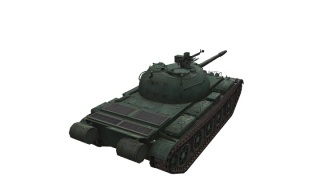 The Type 62 was made available from the gift shop (Last available for purchase July 19-21, 2016). 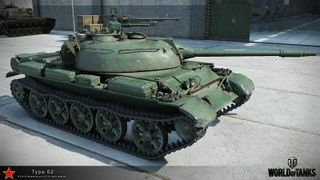 It has also been given away as an award tank (usually as second prize to the Type 59), and was given away as a mission tank for completing the month long medium mission 25 times from September 1st to October 8th of 2014. Designed as a light tank and by all means an appearance almost like the Type 59, but that's as far as the comparison goes. In terms of performance, this premium tank comes equipped with a 85mm gun with decent penetration, accuracy and reload, which is well suited for flanking tactics, fire on the move or sniping towards the sides of and rear of enemy tanks. 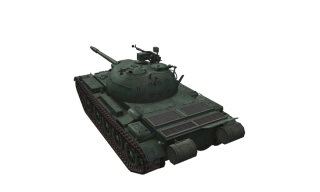 It has better mobility and acceleration than the Type 59 with a top speed of 63km/h. But the armor is very weak despite having the same frontal slopes as the 59 and its not enough to protect the tank from incoming fire from most sources. The Type 62 also shares the same module weaknesses as the Type 59, with a large ammunition rack at the back of the turret. It is not uncommon to find frontal hits to the turret damage both the gun and the ammunition rack. Despite this heartfelt weakness, the Type 62 can be a solid support tank as a good flanker and artillery hunter when the opportunity presents. It also earns very good credit income and its repair cost is very low unlike any other light tanks. Light tank matchmaking - will never be the top tier tank and usually near the bottom; AP penetration is a problem. Inferior to the regular WZ-131 in most aspects, although trades off for premium credit income. Thanks to the low profile, the Type 62 greatly benefits from camouflage modules and camouflage crew training, and it will find excellent performance as passive scout. Also, the good accuracy of the gun in consonance of the vertical stabilizer module can transform the Type 62 into an excellent flanker support tank. -For the flanker: a vertical stabilizer, gun rammer and ventilation module. -For hybrids: Camouflage Net, Vertical Stabilizer, Coated Optics. A small thing to note is that since this tank only very rarely ever goes on sale or is a competition prize tank, it might be very hard to acquire one. However, the WZ-131 performs similarly to the Type 62, sharing the same battle tiers and exact appearance with the exception of colour and emblem position. The main difference between the two is that you can upgrade the WZ-131 (which ends up vastly better) while the Type 62 is much more profitable to run. The preferential crew training for scouting will be Sixth Sense for the commander with Camouflage for the loader, gunner and driver. Stealth is a light tank's best defense, and the Type 62 is no exception. Recommend waiting until the third set of skills to choose Brothers in Arms. Once the first set of training is complete, switch to crew specific training. For the gunner, Snap Shot first then Deadeye to make every shot count. The Type 62 has adequate mobility, so Smooth Ride to increase shooting skill on the move is more important than Off-Road Driving or Clutch Breaking. Given the chances of ammunition rack damage, Safe Stowage followed by Adrenaline Rush for the Loader is important, however as the Loader is also the radio operator the Situational Awareness skill should not be overlooked. As a scouting tank, increased view range is essential, so the Commander should train in Recon. For a flanker, you will still want Sixth Sense so you don't run into traps. Instead of training all of you crew for Camouflage, you will want some with Repair so the you can fix you tracks faster when needed. Smooth Ride for the driver and Snap Shot for the Gunner improve the accuracy on the move. The Norinco Type 62 is a Chinese light tank developed in the early 1960s and is based on the Chinese Type 59 with a reduced main gun caliber, lighter armour and a smaller suite of electronics and other equipment to help reduce weight. 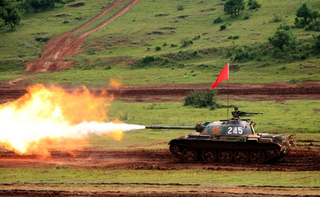 The Type 62 is still used by the Chinese People's Liberation Army Ground Forces and other nations. It has recently been upgraded to modern standards and provides the PLA with a dedicated light tank. It is also known under its industrial designation, WZ-131. When the Type 59 main battle tank was being developed it became apparent that because of high weight of the tank it would have difficulties operating in areas of southern China. These areas mostly consist of mountain ranges, hills, rice paddy fields, lakes and multiple rivers which many times are without a bridge or with bridges which couldn't withstand the weight of the Type 59 tank. 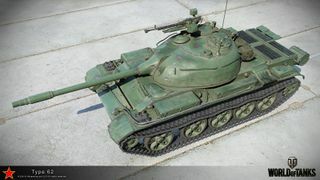 Therefore in the late 1950s the PLA Ground Force submitted requirements for a light tank which could be successfully deployed in the areas of southern China. 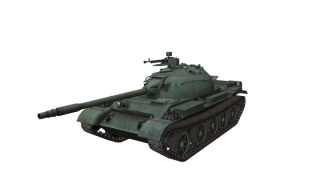 The development of the Type 62 light tank began at Factory 674 (Harbin First Machinery Building Group Ltd) in 1958. Construction of the first Type 62 light tank prototype, Type 59-16, began in 1960 and ended in 1962. 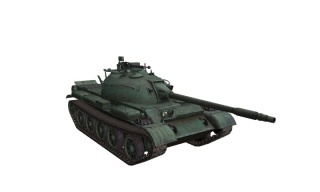 The tank officially entered production and service with the PLA in 1963. Based on experience gathered during the Sino-Vietnamese War an update for Type 62 was designed, consisting 33 different improvements and was designated Type 62-I. After an unsuccessful attempt at fitting the Type 62 light tank with the turret from the Type 63A amphibious light tank a new turret was designed and fitted on the Type 62. This new variant was designated Type 62G. The Type 62 light tank was designed to be a downscaled Type 59 main battle tank, armed with a smaller 85 mm Type 62-85TC rifled main gun and with a much simpler gunner sight and thinner armour in order to reduce overall weight. As such it has a typical tank layout: steering compartment at the front, fighting compartment in the center and the engine compartment in the back. 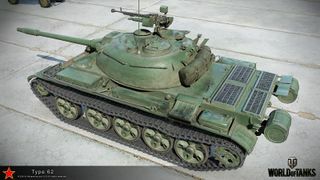 Although the Type 62 light tank is similar to the Type 59 main battle tank in appearance, it has a smaller hull and turret. The Type 62 light tank was given a four man crew configuration, with the driver seated on the left hand side of the front of the hull, the tank commander and gunner seated on the left side of the turret in a tandem formation and the loader on the right hand side of the rear of the turret. The driver's hatch is located on the left hand side of the front of the hull, directly in front of the turret. It has three periscope vision blocks which provide the driver with forward vision. The center vision block may be removed and replaced with a low-light periscope with a 50 m vision range. The left hand side turret hatch also has a periscope vision block on top of it and is most probably used by the commander. There's another periscope vision block in the front of each turret hatch. Apart from his usual duty of reloading the gun after it has been fired by the gunner, the loader is also responsible for operating the 12.7 mm Type 54 anti-aircraft heavy machine gun mounted on the turret's roof. Primary armament consists of 85 mm Type 62-85TC rifled main gun with fume extractor almost at the end of the barrel. It is the same gun as the one used in Type 63 amphibious light tank and can fire AP, APHE, HE, Frag-HE, HEAT, APFSDF-T and smoke rounds. The gun has maximum range of 12,200 m and maximum aimed range of 1,870 m and has a rate of fire of 3 to 5 round per minute. The HEAT projectile can penetrate 495 mm of armour at 1,000 m while the APFSDF-T projectile can penetrate 360 mm of armour at 1,000 m. The Type 62 light tank is characterized by having poor accuracy, given the primitive optical gun sights that the gunner has to use and lack of a gun stabilizer (which differs it from Chinese main battle tanks), a fire control system and night vision equipment. As a secondary armament the Type 62 light tank was given the 12.7 mm Type 54 anti-aircraft heavy machine gun (Chinese copy of Soviet 12.7 mm DShK 1938/46 heavy machine gun) mounted on a rotatable mount on top of the loader's hatch on the right hand side of the roof of the turret and two 7.62 mm Type 59T medium machine guns, one mounted coaxially with the main gun and the other one mounted at the bow of the tank. Also a 7.62 mm Type 59T anti-aircraft medium machine gun can be additionally fitted to left hand side turret hatch. The cast turret features the Soviet-style half-egg shape. The tank carriers 47 rounds for the 85 mm Type 62-85TC rifled main gun, 2,000 rounds for the two Type 59T medium machine guns and 1,250 rounds for 12.7 mm Type 54 anti-aircraft heavy machine gun. The Type 62 light tank uses the torsion bar suspension which consists of five road wheels on each side with a prominent gap between the first and second road wheel and an even space between second, third, forth and fifth road wheel. The road wheels are smaller and lighter than those from the Type 59 main battle tank. The track is driven by a drive sprocket at the rear, with an idler at the front. There are no return rollers. In effort to reduce the overall weight of the tank the original 12150L 12-cylinder liquid-cooled diesel engine from Type 59 main battle tank was powered down from 523 hp (390 kW) to 430 hp (321 kW). This modified version of the 12150L engine weights considerably less and was designated 12150L-3. This new engine gave the Type 62 a maximum road speed of 60 km/h, maximum cross country speed of 35 km/h, maximum road operational range of 500 km and power-to-weight ratio of 20.5 hp/tonne (15.3 kW/tonne). The tank can cross 0.8 m high vertical obstacles, 2.85 m trenches, 30° side slopes and ford 1.4 m deep water obstacles (5 m when equipped with a snorkel). The Type 62 light tank is protected by steel armour. The front armour on the turret is 50 mm thick while armour thickness on the hull armour varies from 15 mm to 35 mm. The armour of the Type 62 is so thin that any light anti-tank weapon (like hand-held rocket-propelled grenade (RPG) launchers) can perforate the frontal plate. the Type 62 light tank is equipped with a radio for which it has an antenna on the left hand side of the turret, in front of the left hand side turret hatch. It is also equipped with a dome shaped ventilator on the right hand side of the turret in the front of the loader's hatch. The tank can be fitted with Type 762 light mine clearance system and Type 762A light multi-purpose mine-clearance system in the front of the hull. There are spots for stowage boxes and additional duel tanks on both fenders. Four on the right hand side fender and three on the left hand side fender. Like the Type 59 main battle tank the Type 62 light tank has a capability to make its own smoke screen by injecting raw diesel fuel into the exhaust manifold. Type 62 light tank officially entered production and service with the PLA in 1963. More than 1,393 vehicles were produced between 1963 and 1989 when it ended. The Type 62 was primarily deployed in Southern China, where it remains in active service to this day. The most famous unit to operate the Type 62 light tanks is the recon battalion directly attached to the 43rd Army Group HQ, Guangzhou MR. It first saw combat during Vietnam War. The PRC supplied the Type 62 light tanks to the NVA before the invasion of Kampuchea. They were widely used by the Vietnam People's Army in 1960s and 1970s and took part in the Ho Chi Minh Campaign in 1975. In 1979 it again saw combat in Vietnam but during the Sino–Vietnamese War. PLA used about two hundred tanks in Vietnam during this conflict and most of these were Type 62 light tanks. They suffered severe losses in combat due to tank's poor protection as the tank’s thin armour could be easily penetrated by hand-held rocket-propelled grenade (RPG) launchers. An upgrade package was developed for the Type 62 soon after the war and was designated Type 62-I. 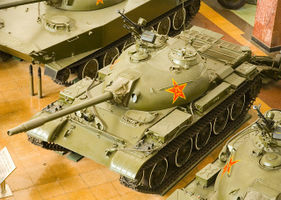 Based on the improvement programs after the Sino–Vietnamese War the Type 62 was found to be too lightly armoured and too poorly armed to be used as a normal tank. Of the two hundred tanks which invaded Vietnam about half were knocked out, underscoring the Type 62's lack of armour and armament. Since then the Type 62 has been shifted to secondary duties in Southern China, such as reconnaissance, fire support and combat with enemy lightly armoured vehicles. Most of 400 Type 62 light tanks which are now in service with PLA Ground Forces have been upgraded to Type 62-I and Type 62G standard. The upgrading to Type 62-I standard started in 1979 and upgrading to Type 62G standard started in 2000. It is unknown exactly how many Type 62 light tanks were upgraded or what units operate the upgraded variants but in January 2005 CCTV showed two Type 62G light tanks belonging to an artillery regiment, Guangzhou MR and the tanks are serving as the recon coy of this regiment. There aren't any indications that suggest retirement of the Type 62 light tank from the Chinese military in the near future. The Type 62 has also been exported widely. Foreign nations which field, or have fielded, the Type 62 include North Korea, Vietnam, Cambodia, Bangladesh, Tanzania, Democratic Republic of Congo, Republic of the Congo, Mali, Albania and Sudan. There is a lot of confusion concerning the North Korean Ch'ŏnma-ho main battle tank which is sometimes considered to be an upgrade of Type 62 light tank. This is incorrect as the Ch'ŏnma-ho main battle tank is based on the Soviet T-62 main battle tank. This originated from the fact that many times tanks like Type 59 and Type 62 are listed as T-59 and T-62. This leads to many confusions which in turn lead to, for example, listing the Albania as T-62 main battle tank operator and calling the Ch'ŏnma-ho main battle tank an upgrade of Type 62 light tank. Its not clear which nations still have them in service, although based on available knowledge it seems that all original users still have it either on active or reserve status except for North Korea which didn't have them in service as of 1995. The Upgraded New version of the tank was seen in the Chinese television series Soldiers Sortie. Type 62 light tank converted into a tracked armoured personnel carrier. Type 59-16 - Prototype of Type 62. Type 62 - Scaled down, lightly armed and thinly armoured variant of the Type 59. It is also known under its industrial designation, WZ132. Type 62-I - Type 62 upgrade designed basing on the experience gathered during the Sino-Vietnamese War. It features 33 different improvements including an external double lens laser range finder mounted above the mantlet of the 85 mm Type 62-85TC rifled main gun for better firing accuracy and a shield for the 12.7 mm Type 54 anti-aircraft heavy machine gun. It is also known under its industrial designation, WZ132-1. Type 62-I fitted with external turret storage racks and hull sideskirts for additional protection against HEAT projectiles and anti-tank missiles. It is a late model. Type 62G (G stands for Gai - "Improved") - Most recent Type 62 light tank upgrade with improved armour layout and original cast turret replaced by a new welded flat-plate turret which also incorporates an improved armour layout as well as four smoke grenade dischargers on each side of the turret. It is armed with a more powerful 105 mm rifled main gun with fume extractor in center of barrel, vertical stabilization system, primitive fire-control system, and night vision equipment. Adopted by Pakistan in Al-Zarrar and Al-Khalid tank. Type 70 - Rebuild Type 62 and like the Type 62-I it is fitted with an external double lens laser range finder mounted above the mantlet of the 85 mm Type 62-85TC rifled main gun but without the shield around the AA HMG. It also has improved sights and a gun stabilization system. Type 79 - Experimental armoured recovery vehicle based on Type 62 light tank. GJT 211 - Armoured bulldozer based on Type 62 light tank chassis. GSL 131 - Mine clearing variant of the GSL 211. It is also known as Type 82.